Presenters at the B12 Congress. May 28, 2010: Congress B12 Integral “Cobalamin4All”: First International Conference Regarding B12 Deficiency held in Driebergen, The Netherlands. 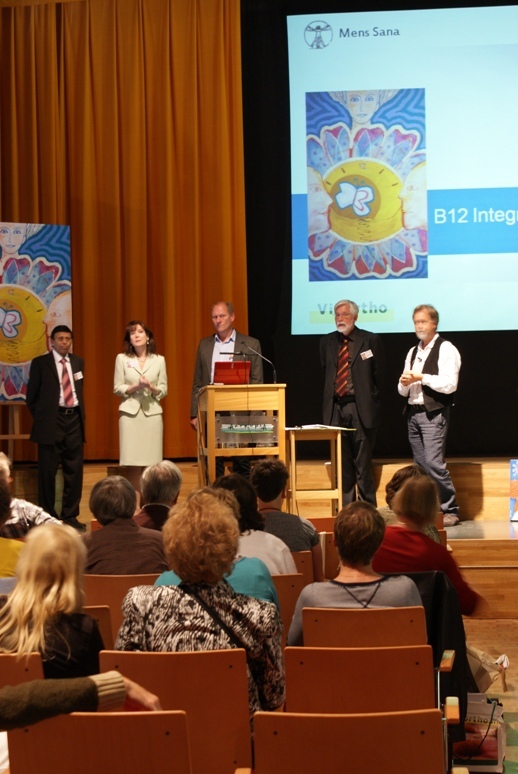 Sally was invited to speak at the Congress B12 Integral conference, sponsored by VitOrtho, in co-operation with Dr. Hans Reijnen. The conference was held at the Antropia Culture and Congress Center located in Driebergen, outside of Amsterdam. She was among several speakers including Dr. Joseph Chandy, Dr. Alfred Austermann, Dr. N. Westerman, and Dr. Hans Reijnen. Sally’s presentation consisted of two presentations. During the first 40 minutes she gave a detailed overview of vitamin B12 deficiency, its causes, signs, symptoms, complications, diagnosis, and why it is frequently misdiagnosed. The second part of her lecture was 25 minutes and discussed the cost-effectiveness of early diagnosis and treatment. She passionately pleaded for the screening of all older adults, as well as symptomatic and at-risk patients. She educated the audience on how billions of health care dollars are being wasted as well as how the U.S. health care system is apathetic regarding this disorder. Both of her presentations were well received. Dr. Hans Reijnen with a patient. Dr. Chandy’s lecture was very interesting and entitled, “Doctor, you have given me my life back.” He discussed the history of vitamin B12 and the difference B12 makes in his patients’ lives. He gave many case reports of patients from his own practice and also detailed how B12 deficiency runs in families. Dr. Chandy practices in northeast England at the Shinwell Medical Centre, County Durham, United Kingdom. A patient support group was formed by his patients and can be found at http://www.b12d.org/. It is a very informative website regarding B12 deficiency and is highly recommended. Dr. Austermann, a psychologist from Germany, presented “The Surviving Twin” Syndrome. Drs. Reijnen and Westerman are both general practitioners from the Netherlands practicing complementary and alternative medicine. Their lectures discussed homeopathic treatments for B12 deficiency. Overall, the conference was very interesting and gave Sally a wonderful opportunity to share her passion and knowledge of B12 deficiency with Europe. Sally was very moved by Karin’s composition and gift. 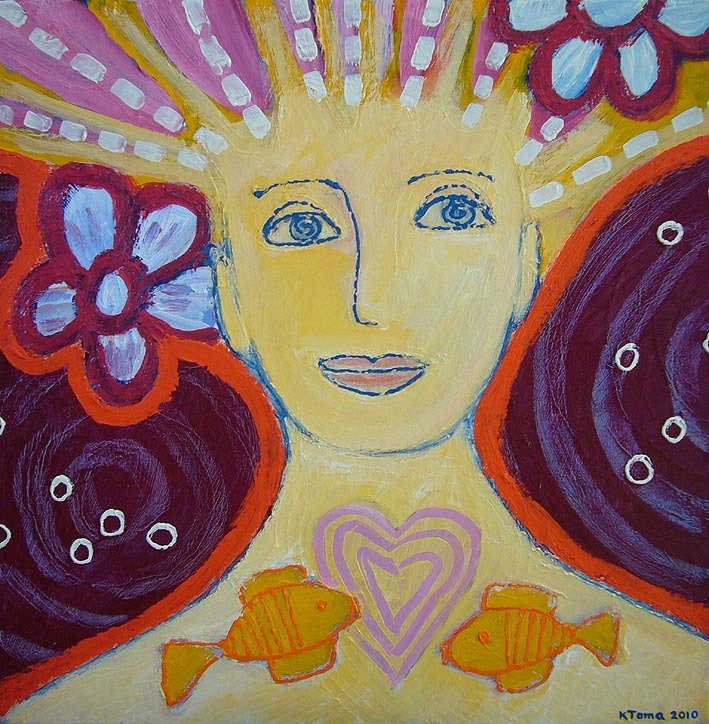 Karin always makes one original painting and each painting is unique. Karin viewed Sally on a BBC interview as well as read up on her, and then created “Queen of the World,” which captured Sally’s quest to inform and educate the world about vitamin B12 deficiency. It is proudly hung in Sally’s office inspiring her with her B12 mission. If you are interested in viewing more of Karin Toma’s works, please visit her website at http://www.karintoma.nl/.